One of the most anticipated cars is the pickup truck formerly known as Dodge now Ram is now available with 3.0 liter turbodiesel V6 engine coupled with 8-speed automatic transmission. This has achieved the title to be the most efficient rear-drive pickup truck on the market. The next most efficient pickup after 2014 Ram is Toyota Tacoma which has 2.7 liter, 159-hp and five-speed manual transmission. It is turbocharged and intercooled having 240-hp at 3600 rpm and 420 lb-ft of torque at 2000 rpm. The warranty is of 5 years per 100,000-mile. It has one of the best and most sophisticated chassis in half-ton segment. It has an A-arm front suspension and a 5-link. Also there is a coil-spring rear suspension. There is also an optional air suspension. Ram 1500 interiors have two options from vinyl-floormatted Tradesman to silver-saddled Laramie Limited. The Ram is huge and is quite big from inside as it may appear from outside. There is a generous room for passengers while the height is 4×2 with a large hood. There is also an option of adjustable pedals for the long-legged drivers. Plus there are two glove boxes and a number of cubbies with power outlets and other connectivity options. Though it is a pickup truck but it does not make any sound that would raise eyebrows of the outsiders. The engine is completely silent while idle and its odor free too unlike some pickups. The good thing is that its exhaust note is silent too. 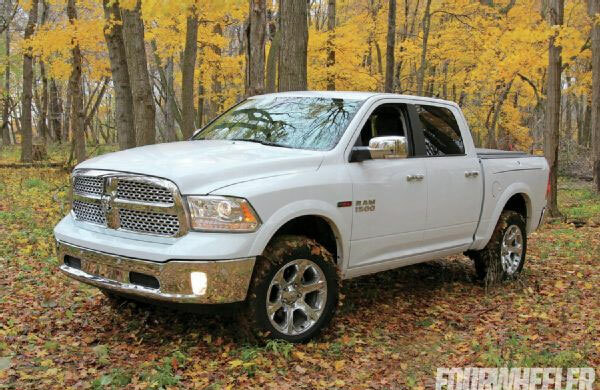 When Ram 1500 is in slow speed with some light load, it may produce a soft metallic patter under the hood but it is so quiet that it will not come into notice. It is almost impossible to tell that you are traveling on diesel.